When 5″ CDs first came on the market, they were considered small compared to their 12″ vinyl forebears. Now, to make slotMusic albums fit in nicely among their optical companions, SanDisk has put the microSD card inside the space required for a standard jewel box. The result is, as you can see by the accompanying photo of the of the Robin Thicke slotMusic album Something Else, a wee bit of excess space — enough to fit the bundled USB reader, a little carrying case with postage-sized album art, and anti-theft devices all generously enveloped by a whole lot of plastic nothing. And yet, I found myself in a usage scenario for the fledgling format just this week. On Tuesday, I attended a CD launch concert for my friend Tamara Hey’s new album Miserably Happy. It was a great show and I bought the CD there but, because I was preparing for a trip the next day, didn’t have time to get to a PC, rip it, and transfer it to an MP3 player. As a result, I didn’t get to listen to the album until today. Alas, though, it looks like I would have been out of luck if I planned to listen to it on a PSP. I tried the slotMusic album with a small Memory Stick Duo adapter branded Kingston from a shop in Hong Kong but the PSP just seems to get stuck reading it. I plan to try it with a Sony Ericsson cell phone as well to see if it fares any better. When the new MacBooks were announced, I shared my skepticism regarding rumors that its trackpad would become a touch screen citing the impracticality of using the area for both cursor control and secondary controls. Fujitsu though has resolved that conflict by placing a 4″ touch screen between the keyboard and main display of its 16″ n7010 and Laptop seems mostly pleased with the results. So perhaps there is potential for laptops with second screens, albeit serving a different purpose than Microsoft envisioned with SideShow. Or perhaps he Microsoft concept and Fujitsu implentation could be combined by having the touchscreen swivel 360 degrees so that it could be used as a secondary display/control pad when the laptop was open or as more of an independent quick read of PC information when it’s closed. It seems, though, that cost is not what has been killing SideShow but rather that master of convergence the smartphone. Need instant access to e-mail, appointments, pictures and music when you’re PC is hibernating in its bag? Check check, check and check. And of course the smartphone also enables you to act on that information performig tasks such as replying to that e-mail. i always liked the concept of SideShow better as a display detached from the PC such as a digital picture frame. A recent Switched On discussed the latest offering from Lala.com, which is trying to pioneer the dirt-cheap Web song as an alternative to downloads. As part of its new offering, Lala provides hosted online access to your local music library, a feature that led to the demise of longtime digital music gadfly Michael Robertson’s MP3.com. But today the BBC reports on Robertson’s new venture Datz, which offers a different take on subscription and music. Like Nokia’s Comes with Music program, the Datz device, a security key that attaches to your PC (Windows-only for now), enables all-you-can-eat access. Unlike the Nokia program, though, the songs are in MP3 format and can presumably be used with any device . The product/service combination costs £100 for a year of access, kind of the digital music version of magicJack, which has done well spreadking its message via infomercials. Only two of the big four music labels have signed up for now, and of the program is limited to the UK, but it seems like a fresh and winning approach, certainly one that will offer a better value than existing subscription services if Sony BMG and Universal Music come on board and the subscription price after a year stays below $15. I only question why the hardware is needed. What difference does it make if someone is turning on the spigot from only one PC in the house? 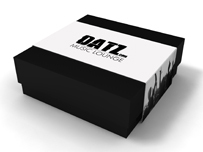 Both Lala and Datz are showing that access and ownership are not mutually exclusive ideas, although Datz offers a level of assurance that consumers can continue to use their media should the venture fail.. And Datz not funny (sorry, Dave). Today’s a sad day for the former employees of consumer electronics specialty retailer Tweeter, which was regionally strong in New England. Some questioned whether the store would make it through the holiday season and those questions were answered last night as the chain was sold to a liquidator. Specialty retailers did well in the early days of flat-panel television, but have struggled as more of that market has shifted into mass merchants such as Walmart, Target and Costco. With sales of DLP-based rear-projection TVs fading as flat-panel TVs grow larger and larger, Texas Instruments is apparently working on technology that will allow different people watching the same display from different angles to see different images provided they’re wearing special glasses. I saw similar technology from Sharp at CES in 2007 or so and it worked pretty well even without additional eyewear. I doubt the technology will end the long-running war for the remote in he living room but it could have commercial applications and makes sense for in-dash displays where the passenger might want to watch a movie while he drier might want to see navigation information. MID skeptics argue that modern devices that are larger than a cell phone but smaller than a laptop are doomed. They’ve certainly had a rocky road in the past although portable game consoles could be considered an exception. That said, it is even difficult to make the case that a netbook is something that should be carried around throughout the day. Well, at least two companies are trying to address the tweener portable market with mobile appliances — one strictly so — that look like they’d have more potential combined. The iMovio iKit is a pocket-sized multimedia computer deigned for basic communications tasks and media playback; it’s due in Q1 of next year. It is slated to come with Linux although Android and Windows Mobile are both possibilities. The developers are apparently leaning toward Opera mini as the browser. It will feature an integrated camera and a touch-screen is on target before the end of next year. It sounds a bit like the first-generation Mylo but, like the Nokia N810, will feature Bluetooth (in addition to Wi-Fi) for those who can figure out how to get it online paired to a cel phone. And I wouldn’t be surprised to find some old Clie users show some interest in it. In contrast, there’s nothing entertaining about the Pomera DM10 Digital Memo (not to be confused with another DM10 note-recording device), a Japan-only product optimized for taking notes. It has a folding keyboard that looks somewhat similar to the long-running Stowaway line. It has a 4″ VGA display that should help it avoid being the blocking presence that laptops are at meetings (although resistance against that social convention is fading). It also squeezes 20 hours of battery life out of a pair of AAA batteries. As you might expect, standard batteries and the folding keyboard make for a bit of a chunky profile, and the Pomera is 30 mm high. In addition to USB, you can transfer your notes to a PC using a microSD card. So, it’s pretty simple. Let’s get the capabilities of the iKit together with the keyboard of the Pomera device. Have your people call their people. You’re welcome, guys. While I like the product category, I’ve written before about my disdain for the term “netbook.” Fortunately, Dell and HP have used the sexier term “mini” to describe their offerings in the space. And after seeing HP’s Mini 1000, the consumerizd version of its early entrant, the 2133, the company seems to have a winner on its hands. In addition to disliking the term “netbook”, I’m also not a fan of positioning them for content consumption as opposed to content creation. That dichotomy has long existed for most users of existing PCs. A better approach is to make the case that this is the device to use when your smartphone isn’t going to cut it. And if Intel and friends are trying to reserve that messaging for MIDs, an alternative is to position the MID more for communication while the netbook is more for productivity. I don’t want to say this is starting to become a superficial academic segmentation, but even the angels are complaining about how crowded the head of this pin is getting. And especially for HP, if netbooks are little more than a pretty screen, why focus so much on the keyboard? The Mini 1000 continues with the best-in-class custom keyboard that the 2133 offered. In contrast, the Sylvania netbook meso g that I’ve recently used has no right Shift key. Despite maintaining that Linux has is place in portable computing and admiring how HP appears to have done the best job to date of building a superior Linux experience with MIE atop Ubunutu, I continue to be skeptical of the appeal of Linux on these products with only a $20 premium for Windows XP. Windows may be “a devil” compared to the streamlined MIE, but it is the devil that most people know, and has probably even endeared itself more to consumers with all the negativity surrounding Vista. What’s missing from the Mini 1000? First, I hope the six-cell battery doesn’t protrude as much as the 2133’s did. Second, the true potential of netbooks won’t be realized until we have better wireless broadband options, but the removal of the ExpressCard slot is no deal breaker as Apple has long showed with the MacBook. The flanked trackpad buttons aren’t ideal, but they are a far better compromise than moving keys around the way Dell did on the Inspiron mini 9. Dell shouldn’t have to do that on its 12″ “netbook”, which may just wind up with the highest volumes in the category yet even if it cannibalizes other 12″ laptops. In discussing Mac cloner Psystar back in April, Jason O’Grady waxed nostalgic about Power Computing, the most flamboyant of the Mac cloners during the short-lived period of Mac OS licensees. As you can see from the company’s promotional campaign back then, times have changed a bit. Despite its now-famous unibody design, the MacBook Pro looks much more similar to its predecessor than the MacBook. This includes the speaker grilles that flank the keyboard. Perhaps some prefer the perforation, but it seems that the prevailing design trend has been to hide the grilles, at least if certain televisions that were introduced at CES 2008 were any indication. And speaking of elements hidden, I thought there might be a bit of learning curve to the buttonless trackpad, but there isn’t. Clicking occurs in he same area to which the thumb is naturally drawn. It’s not like the whole pad moves uniformly, though. It’s hinged a the top so you’ll get the most travel toward the bottom. I also thought that Apple would allow more flexibility about defining trackpad click zones but, no, there’s just the option for a right click on the corner of the keyboard. I was also impressed with the new swipe gestures. They are more intuitive than I thought they might be. And speaking of surprises, Apple’s DisplayPort-based 24″ Cinema Display has a few of them. Apple is branding the monitor as the first one designed for notebooks, and backing that up with a few nice touches such as a MagSafe connector that allows the moniitor to charge a nearby MacBook and automatically transferring the Webcam functionality to the monitor using USB. Having spent several days with the T-Mobile G1, it is clearly a strong new entrant in the smartphone space that should satisfy many T-Mobile consumers that have looked longingly at the iPhone, particularly those that want a great mobile Web experience. It’s especially impressive that Google has been able to create such a competitive experience with an operating system designed to run on many different kinds of smartphones. Its 3.2″ screen, while smaller than the iPhone’s, offers the same resolution, and never has to compromise its available real estate to accommodate an on-screen keyboard. However, the need to open the keyboard, like on many side-sliders, can sometimes feel disruptive. The arc slider mechanism of the G1 is somewhat novel, but its hinge can emit an unpleasant creak when pressure is applied to it. Moreover, the overall look of the device is dated, with four buttons lining the bottom in a layout that is reminiscent of PDAs of yore. While the Home and Back buttons are essential, the Menu button could probably be replaced with a gesture. The iPhone is better optimized for a touch experience in general, its multitouch screen makes zooming and other tasks easier, and it also takes better advantage of its accelerometer, with more applications taking advantage of dynamic screen orientation. The G1, in contrast, will automatically change to horizontal orientation for nearly all applications — including e-mail — when its screen is slid open.